All of Me. All the Time. is a campaign to highlight the gaps in current civil and human rights laws and amplify the reality that all of who we are needs to be protected all the time. 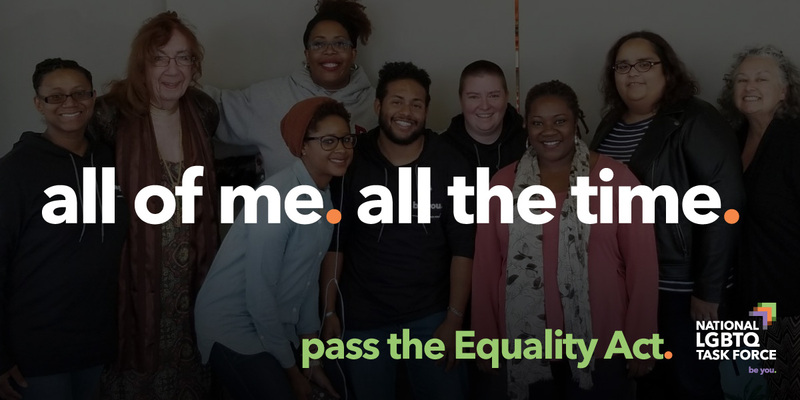 By signing on you are committing to join us in amplifying the stories, voices, and experiences of LGBTQ people of color who have been left to fall through these cracks in the law. Sign on to be part of our All of Me. All the Time. campaign today! Yes! Sign me up to be part of All of Me. All the Time. Question - Not Required - Hearing real stories from real people is powerful. Being able to share your stories about discrimination you've experienced because of your sexual orientation or gender identity/expression will help us prove to law makers and the media that federal protection against discrimination is so badly needed. You can share your story here. And thank you so much! * Question - Required - I'm willing to let the Task Force use my story to advocate for making the Equality Act law.